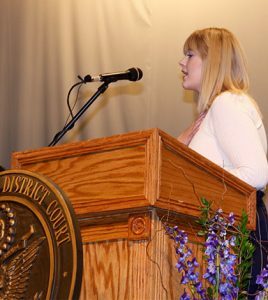 Pictured, Waterloo High School Student Council President Jersie Few leads the new American citizens in the Pledge of Allegiance. They came from 30 countries, including South Africa, Mexico, Canada, Jamaica, Nepal, Honduras, Bulgaria, Taiwan, Burma, China, Peru, Belarus, New Zealand, Cambodia, Zambia, Ghana, Bulgaria, Burma, Thailand, Iran, Iraq and South Korea. They had different professions: doctor, professor, retail worker, member of the Armed Forces, baby sitter, college student, programmer, nurse, teacher and nonprofit employee. They ranged in age from 19 to 86. 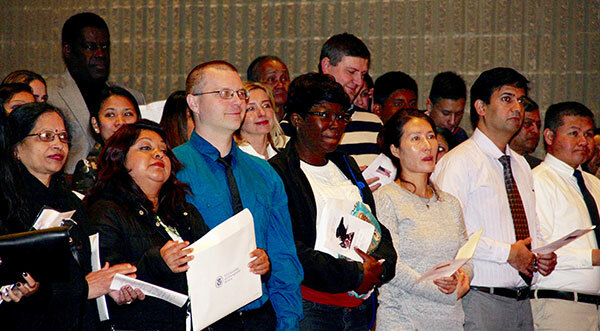 As different as they may seem, these 58 people had one thing in common: they became citizens as part of a naturalization ceremony last Wednesday at Waterloo High School. Read more in the January 23, 2019, issue.